The Asian and pan-Pacific market is a crucial component of the global satellite and ancillary business market. Indigenous and foreign investment in Asian projects continues to mount, expectations remain positive, albeit somewhat muted, all despite the worldwide economic challenges facing business. The Year of the Ox  2009  will require an even greater concentration on the core elements that help business succeed  customer service and soul inspiring technologies. Over the years, many commentators on the Asian satellite market have wondered aloud about when consolidation of satellite operators in the region would finally occur. The stock answer given to the question is that Asia remains dominated by national operators with little interest in forfeiting the pride that is garnered by a country having its own flag satellites in space in exchange for a more economically rational overall Asian satellite market. Others have noted that often there are serious disparities between what some satellite operators think they are worth and what another operators may be willing to pay for them. Further, it is well known that regulatory issues can be a serious, if not insurmountable, barrier to consolidation. Two primary gauges of industry improvement are the annual NAB Show and the USAs Television Bureau of Advertising calculations of broadcaster budgets. Both seem to be indicating that the recovery everyone is hoping for is already under way. There may still be obstacles ahead, and setbacks, but irrefutable indications of a recovery are already evident. In early 2009, the pirate hijacking of the Maersk Alabama and its 20-man US crew off the Somali coast garnered worldwide media attention. This recent attack shed light onto the constant threat vessels face when they are off the grid and out of country jurisdiction. This event, and other piracy-related activity since then, has thrust the spotlight on the absolute need for nautical safety by ship owners, managers, and crews. Asia represents an enormous challenge to companies who wish to penetrate this regions broadcast markets. With a plethora of languages, religions, and political cultures, Asia presents a varied geographical makeup, which makes for an exciting, yet daunting, business market. As the worlds insatiable thirst for information access continues to grow at an ever increasing rate, satellite service providers are faced with the need for power amplifiers that can deliver large amounts of linear power reliably. Todays complex modulation and coding schemes increase the number of bits one can pack into a hertz of transponder bandwidth and when it comes to transmission, more bits requires more power. High-order modulation schemes become an inherent challenge when factors such as single-carrier spectral regrowth, multi-carrier intermodulation distortion with associated memory effect and AM/PM phase distortion are factored into the equation. SatMagazine timed this interview with Mr. Perrault perfectly  only a few days ago as of this writing, ProtoStar II | IndoStar II was successfully launched by an International Launch Services (ILS) Proton Breeze M rocket from the Baikonur Cosmodrome launch pad in Kazakhstan. When Rob Bednarek takes the podium as the featured keynote speaker at CASBAA on the eve of CommunicAsia in Singapore later this month, he will unveil the inner strategy driving his newly combined SES divisions global success. He will also share his view of the dynamic Asian markets and how his companys energetic team and long-term participation in the market continues to help Asian customers to benefit from satellite services. 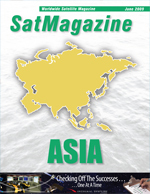 The Asian region is, and will continue to be, a growing market for satellite ground system providers. Due to the geographic make up of Asia, satellites are the perfect solution for providing the region with voice, data, and video services. As such, the need for satellite ground system infrastructure seemingly increases on a daily basis, with more and more requirements for satellite control systems, ground equipment/network management systems, and satellite earth stations. While successfully gaining market share in Asia can prove challenging, the potential rewards can be significant. Integral Systems has met its challenges and is a proven success in Asia, delivering every aspect of satellite ground systems while also rapidly moving into adjacent arenas (e.g., hybrid/cellular networks and remote site management). The analog to digital switchover is providing a major catalyst for operators to think differently about how they deliver pay-TV services. As the number of subscribers in Asia continues to grow, operators have a huge opportunity to increase ARPU with new and compelling content. Inventive use of satellites for major tourism promotions, Annual General Meetings, corporate dinners on live hook up, and prize draws are all part of a growing transmission demand for GlobeCast Australia. Many mothers and grandmothers across Australia were treated to a unique gift this past Mothers Day. Australias best selling artist André Rieu returned to Australia for a special Mothers Day visit to launch Live In Australia on the big screen in cinemas across Australia and New Zealand. Few people know the troubles of Norfolk Island, located in the Pacific Ocean between Australia, New Zealand, and New Caledonia. In fact, few people may know of Norfolk Island at all. The tiny, self-governing island territory of Australia is home to about 2,000 people and covers just over 34 square kilometers. With only one airport and no railways, waterways, ports or harbours, the islands remoteness and dependence on distant suppliers of goods and services, alongside its growing tourist industry means that residents and businesses are heavily dependent on a telecommunications infrastructure, which was heavily burdened by bandwidth and capacity limitations. Not surprisingly, they have only one telecommunications service provider on the island  Norfolk Telecom, a Government Business Enterprise wholly-owned and operated by the Administration of Norfolk Island.